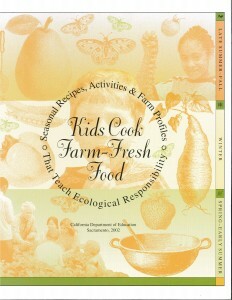 Kids Cook Farm-Fresh Food is an introduction to California’s diverse farm-fresh produce, explaining how farmers grow it in ways similar to the students’ own gardens at school. The hope is that learning how to cook the produce and discovering the delicious flavors of the colorful fresh fruits and vegetables will provide students an incentive for lifelong, healthful eating habits and an interest in the working landscape of California. Ask typical third-graders where their food comes from, and they are likely to say, “the market.” Yet, if pressed for more detail about how it gets to the market, they probably do not have a clear answer. In this busy, technologically advanced world, people rely on many modern conveniences for shopping and eating to save time. However, such conveniences as supermarkets and fast-food restaurants may disconnect people from the original source of food: the farms. In the past people were aware of the important role farming played in their lives. Many people worked on farms or lived in farming communities. Fresh fruits, vegetables, dairy products, and meats were bought directly from nearby producers. Farms provided healthful, open spaces around cities. Today, however, most people live in urban areas. Although California still has bountiful agriculture, fewer and fewer of its residents are aware of the impact farming has on their lives. Children, especially, have lost touch with how and where food is grown. They lack an understanding of the ecosystems, the land, the people, and even the plants that produce their food. The story of where food comes from can quickly turn into a world geography lesson. It is the tale of California’s diverse and beautiful working landscape and the creative, entrepreneurial people who cultivate the countryside. Specifically, this guide introduces readers to a lesser-known but growing niche of California’s vast agricultural productivity, that of organic and sustainable agriculture. Agriculture is an important part of the state’s economy and environment. The state’s natural resources and human resources are diverse, with a great capacity for food production. The intent of this activity guide is to introduce children—through direct experience—to the pleasures of fresh, seasonal, locally grown produce. By exploring local produce and by cooking seasonal foods in class, students learn about the ecological, economical, and social benefits of sustainable agriculture and the diverse farm-fresh produce available in California. The guide contains ideas for activities, recipes, profiles of farmers practicing sustainable agriculture, and correlations to academic standards. Growing food and eating are central human experiences through which many aspects of life may be revealed and examined. The guide helps schoolchildren understand the connections between their own health, healthful food, and a thriving regional, sustainable agriculture.